Dominic Cooper attended the 2014 Audi International at Guards Polo Club to support England as it faces Argentina for the Coronation Cup on 26th July 2014 in Egham, England. 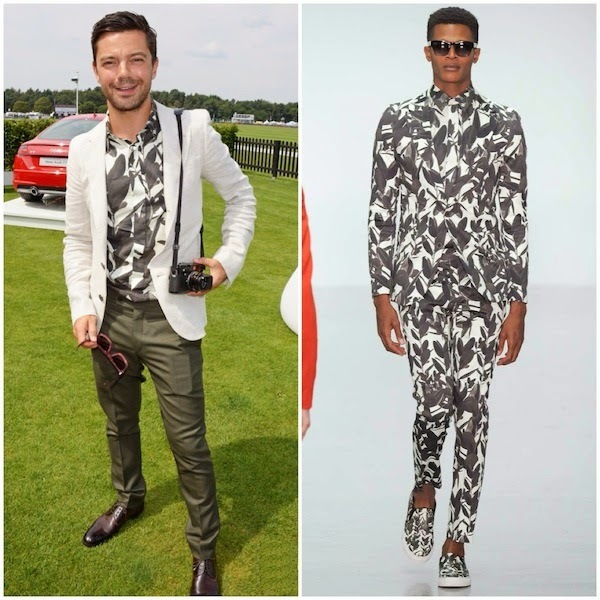 Dominic Cooper was pictured in a beautiful leaves print shirt from A. Sauvage Spring Summer 2015. Dominic Cooper looked very stylish at the event. When I saw the above picture, I pretty much decided that I am going to buy that leaves print shirt. The print reminded me of Chinese calligraphy paintings done in dark grey ink (I am going through a phase of getting in touch with my heritage...). I searched high and low for the shirt, and finally found the match: A. Sauvage Spring Summer 2015. I thought only actresses wear next next season stuff, and if I may bore you: most actresses do fit into sample sizes so it is easier for the ladies to borrow pieces from the showroom. There is however a size disconnect for most men, as not many fit into the runway sizes of EU36/38 shirts and EU30/32 trousers. I am of course making a very general assumption. Seasonalities and sizes aside, I really love Dominic Cooper's look at the event. From the gorgeous painterly shirt to those olive coloured fitted trousers, capped off with deep red / oxblood coloured leather shoes. I would not hesitate to wear this outfit in a heartbeat, every piece worked so well together. And he carried my ultimate dream camera: the Leica M-E. Dear Dominic, can we please be friends?